California gets federal approval to close Healthy Families -California will begin moving 860,000 lower-income children from Healthy Families to Medi-Cal next month after receiving last-minute federal approval today, state health officials said.The shift comes despite a request from Senate President Pro Tem Darrell Steinberg to postpone the switch because he fears too many children will lose access to their medical providers.Many health care advocates fought the shift in June and felt that Healthy Families had served its beneficiaries better than Medi-Cal could. But Gov. Jerry Brown asked lawmakers to end Healthy Families as the state prepares for President Barack Obama’s health care overhaul in 2014, saying it would be more efficient and ultimately save money. He would also scale back — and possibly eliminate — dozens of rules that districts must abide by to receive billions in state dollars. Some of those requirements, such as a mandate to limit class size, have been suspended amid Sacramento’s recurrent budget problems but are set to resume by 2015. California Democrats signal they want to reform Proposition 13 -The third rail of California politics may not be as deadly as once thought.Three and a half decades after the passage of Proposition 13 shook the political landscape in California and sparked a taxpayer revolt across America, voters appear to be warming up to the idea of reforming the initiative as long as protections for homeowners stay intact.And the apparent sea change in public attitudes, combined with the two-thirds majorities Democrats now hold in both chambers of the Legislature, has emboldened some politicians to take aim at the iconic measure. “It is time for a fix, because Proposition 13 is broken,” said Assemblyman Tom Ammiano, D-San Francisco, who plans to introduce a bill next year aimed at forcing businesses to pay higher property taxes. Lawmakers in VIP loan program violated no rules, House panel says -The House Ethics Committee has found no rules violations by lawmakers who used a VIP loan program from Countrywide Financial Corp.The committee’s leaders said its investigation largely led to the same conclusions as the Senate Ethics Committee, which determined in 2009 that there was “no substantial credible evidence” that two of its members had broken rules by accepting loans through the special program.Although the House Ethics Committee likewise cleared members of that body, committee Chairwoman Jo Bonner (R-Ala.) and top Democrat Linda T. Sanchez of Lakewood said in a statement that there were serious concerns about some allegations against House staffers. New year means changes for California taxes, driving, light bulbs -State lawmakers laid down hundreds of new laws that will change how millions of Californians drive, shop and do business in 2013, but perhaps the most sweeping was imposed by voters themselves.Voters in November passed a state sales tax increase starting Jan. 1 and also retroactively hiked income taxes for upper-income earners to avoid deep cuts to education.Also, starting Jan. 1 Californians will pay more at the cash register for lumber products, cities will get limits on new red light cameras, gun owners will no longer be allowed to carry unloaded rifles and shotguns in public view and unauthorized immigrants will move a step closer to being able to obtain a driver’s license. House Ethics Committee closes book on Countrywide loans -Closing the book a story that had caused some embarrassment for two local members of the Congress, the House Ethics Committee has concluded that no violations of law or standards of ethical conduct were violated by members who received so-called “Friends of Angelo” mortgages from Countrywide during the time Angelo Mozilo was chairman of the now-defunct lending institution.Retiring Rep. Elton Gallegly of Simi Valley and Rep. Howard “Buck” McKeon of Santa Clarita, who now represents Simi Valley, were among the recipients of those loans. Both asserted that they not only did not receive special treatment, but were unaware that their loans were part of any special program initiated by Countrywide.The Ethics Committee’s report substantiates those assertions. Chevron moving 800 Bay Area jobs to Texas -Chevron Corp. will move up to 800 jobs – about a quarter of its current headquarters staff – from the Bay Area to Houston over the next two years but will remain based in San Ramon, the oil company told employees Thursday.The jobs – generally, technical positions dealing with information and advanced energy technologies – are all tied to Chevron’s worldwide oil exploration and production business, much of which is based in Houston. The company reported the shift in an e-mail to its employees Thursday.San Ramon will remain Chevron’s corporate headquarters, the company said. About 3,500 people work at Chevron’s office park on Bollinger Canyon Road. Another 3,000 Chevron employees work elsewhere in the Bay Area, most of them at the company’s refinery and technology center in Richmond. Some county judges change sentencing patterns -California’s new felon imprisonment law, which requires low-level offenders to serve their time in county jail rather than state prison, is beginning to reshape how some county judges hand down those sentences.A study by the Chief Probation Officers of California finds an increasing number of judges using split sentences, requiring offenders to spend part of their time in jail and the other part in a community program or under probation. Without a split sentence, the entire term is spent in jail and when offenders are released, there is no followup.From the time the new prison law took effect in October 2011 to June 2012, the probation officers group reports, 23% of all local prison sentences were split. That means an increase in the responsibilities of county probation offices, but a lighter load on jails. However, the organization says there is an inconsistent use of the sentencing tool among the state’s 58 counties. Judges in 18 counties deliver split sentences to more than half their felons, including Contra Costa and San Joaquin. On the other hand, only 5% of Los Angeles County felons, for example, are given split sentences. California health exchanges – ‘Mo Money’ -The Obama administration has a lot riding on California’s implementation of Obamacare, also known as the Patient Protection and Affordable Care Act. How the state implements the new insurance exchanges, and whether or not it is done successfully, will be an important test of nationalized health care.But a state-run health exchange puts the burden onto the state and the expense ultimately on the taxpayers. The state loses the authority and flexibility needed to best meet the needs of its people… Which is why more than 30 states have told the Obama government that they will not create state-run health exchanges, leaving the Obama administration to build and operate online health insurance markets for more than 30 states. This is an unexpected problem, unanticipated by the federal government when Obamacare was passed in 2010.But this isn’t a problem for Democratically controlled California government, which will do just about anything for a federal grant. Tough Year Ahead for California Taxpayers and Wealth Producers -California’s Democratic leaders are giddy about the future now that they have gained everything they wanted in the last election—voter-approved tax increases and a two-thirds supermajority in both houses of the Legislature, thus rendering Republicans little more than an annoying irrelevancy that can no longer block tax hikes.Will Democrats just ramp up the taxing and spending spree or will some semblance of a “moderate” Democratic caucus emerge to offer a limited check on those tendencies? Either way, it’s hard to find good news for taxpayers or business owners, although the state’s public-sector unions ought to be stocking up on champagne.Given that backdrop, I offer some subdued predictions for the New Year. Prediction 1: Gov. Jerry Brown and the legislative leadership will continue to argue that the state government is on a bare-bones diet, and therefore continue to look for additional revenue to fund it regardless of mounting evidence of waste and excess. Simi Valley businessman returns disputed $70,000 grant -A Simi Valley businessman has returned a $70,000 redevelopment grant to the city after months of speculation by a local Tea Party leader and others that it might have been improperly authorized.Used-car dealer Kelly Kolarek, who said he used the 2010 grant to renovate the site of his K&J Auto Exchange at 2430 Tapo St., gave a check to the city Wednesday, according to a news release he issued and an email from City Manager Laura Behjan to city officials.Denying there was anything improper about the grant, Kolarek said in the release that he returned the money primarily because “these funds will cause me huge adverse tax implications” with the approval of Proposition 30 in November. The measure raises taxes on those who make more than $250,000 annually, to help fund education. Remember my piece about Rep. Buck McKeon and his defense industry friends supporting the California Assembly candidacy of his wife, Patricia McKeon? Rep. Buck McKeon is regulated by federal law as to how much he can receive as political contributions from special interests, like defense contractors, who receive business from the federal government. His wife, Patricia McKeon who is his federal campaign treasurer is paid a salary from her husband’s campaign account. I have documented this unethical transfer of federal campaign funds a couple of times. Both McKeon’s are quite good at enriching themselves from their defense contractor friends and Buck’s campaign account. Patricia McKeon is now running for the California Assembly and the McKeon’s are taping the defense contractor tip jar again. Sort of a double dip, no? Perhaps or perhaps not, but it is certainly revealing how these two POLS have enriched themselves while doing the public’s business. It isn’t Buck McKeon they’re raising money for. They’ve already given him all they can. It’s his wife, Patricia McKeon, who’s running for a state Assembly seat. That’s odd. The Barritt’s have never donated to a state legislative candidate before. Neither has Aerospace Dynamics. I wonder what possibly could have made them change their minds and throw a big shindig for Mrs. McKeon, currently running a very distant fourth in a 4-man primary. I cannot vote in this election since I live in Thousand Oaks which is outside the district. But, I am embarrassed at this blatantly unethical conduct on the part of the McKeons. If I could vote in this election, I would vote for Scott Wilk. What a shocker – NOT! Patricia Mckeon is trying to shut me down? It’s been no secret that the Mckeons hate this blog. They have actively been trying to silence me for some time now. This is no longer just an opinion, but a matter of fact. First they falsely accused an innocent man, Scott Wilk, of running this blog. (There are too many links so just Google “Patricia Mckeon lies“) They made this accusation to the LA County DA, a Mckeon endorser, in an attempt to dirty Wilk’s name. Well, that didn’t stick and they were told to pound sand. So now they are trying to get the domain for this blog turned off in yet another attempt to silence free speech. Where are these people from, China? Does our constitution and the rights it guarantees mean anything to Buck and Patricia Mckeon? Here are the details that I now am aware of. Patricia Mckeon filed a complaint with Network Solutions(NS) to have my domain name revoked. Patricia herself, while speaking with a representative from NS, made the claim that she was being defrauded. She made these claims because I choose not provide my real name and address on the domain registration (Duh! Does the word anonymous mean anything). Buck and Patricia are currently considering civil litigation against me. Well, I wish them good luck, because I don’t think they will be successful. But, if they are – for some odd reason, I have extended the invitation to the writer to blog here or over at flapsblog.com anonymously. 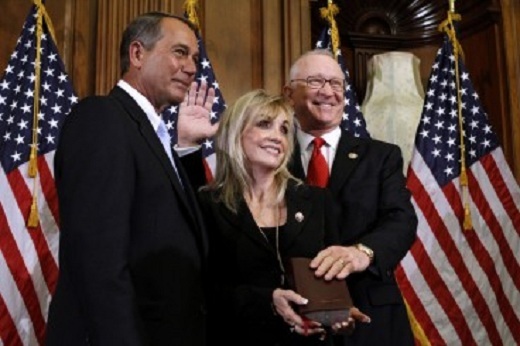 Remember my previous post on how Patricia McKeon enriched herself with the help of her husband, Rep. Buck McKeon? The chart I included in the post were figures from 2001-2006. Now, there is a new report out that covers the 2008 and 2010 election cycles. A new study by Citizens for Responsibility and Ethics in Washington (CREW) of House members found 248 examples of members using their positions to enrich relatives or themselves, and almost all of it apparently was done legally. Some of those cited in the study, entitled a “Family Affair,’ are well known lawmakers, including Rep. Ron Paul of Texas, a Republican presidential candidate, Rep. Howard “Buck” McKeon, R-Calif., the powerful chairman of the Armed Services Committee, and Rep. William Lacy Clay (D-MO) a member of the House Financial Services Committee. Let’s see that is a total since 2001 of over $500,000 that Patricia McKeon has received from her Congressman husband’s campaign account. All of this is legal, but are Rep. McKeon and Assembly candidate Patricia McKeon interested in public service or enriching themselves? This will be something that candidates in the 38th District California Assembly race will have to ask Patricia – if she ever shows up to debate. Candidate filing has been extended until Wednesday. It is understandable that the Los Angeles County GOP did not endorse in this race. Republicans representing Los Angeles County have chosen to endorse Congressman Howard “Buck” McKeon in the local House race, but chose not to endorse any candidate in the 38th California Assembly District race, including McKeon’s wife, Patricia. On Saturday, Republicans representing 26 districts inside Los Angeles County met in Los Angeles to select candidates for endorsement in upcoming city, county, state and federal elections. Bob Haueter, chair of the 38th Republican Party Central Committee, was among those attending the event. “The L.A. County Republican Party endorsed Congressman McKeon for re-election over his two Republican primary opponents,” he told The Signal on Sunday. “The (L.A.) party chose not to endorse in the contested 38th Assembly seat, where Patricia McKeon, Scott Wilk and Paul Strickland are seeking election,” he said. There are three Republican challengers and no incumbent office holder. It will be a highly contested race. California Assemblyman Cameron Smyth who currently holds the seat pictured above is term-limited and prohibited from running for re-election. Smyth has endorsed Scott Wilk, however. A “NO” endorsement, if anything, is a slap in the face to Patricia McKeon since she is the wife of Santa Clarita Valley Congressman Buck McKeon, who was endorsed for re-election.